The source is forum SAY-7 Monica and Karina-forum., bread is very tasty! Quote of the author: " Slow initial kneading without yeast cause intense formation of gluten. Bread turns out very porous, with bread taste, which is a bit like the taste of sourdough bread ". Put in a bowl of a food processor mineral water, sugar, salt and sifted flour, knead dough for 10 min (dough turns out not a clod, but sticky and not floating). Then turn off a food processor and let dough stay for 10-15 min. Dissolve yeast in a very small amount of water (about 1 tsp), add in dough, tur on a food processor again and knead dough for 10 min. I did for 5 min, it was sticky, I shifted it on well sprinkled with flour table and kneaded for another 5 min by hands, to get smooth dough, adding flour. Next roll a ball form dough, cover with film or napkin and let it rise for 30 min. I shifted in bowl, cover and put in the oven heated at 30 degrees. Then divide dough in 7 parts (I divided in 4, so it seemed that there was not much dough), roll balls, cover and let them rise for 15 min (I spread them on bakung sheet and put again in heated at 30℃ oven). 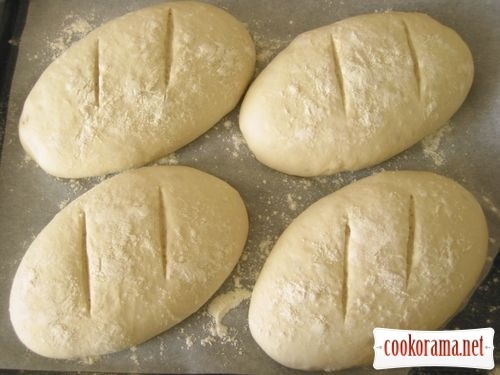 Then cover baking sheet with paper, sprinkle with flour, mold oblong buns from balls, something like long loafs, but small, shift them on paper and sprinkle with flour well, cover with a towel and then remove for rising, this time for 1 hour (I put in heated oven again). Then make in bread cross shallow cuts with a sharp knife. Heat the oven at 210 degrees. 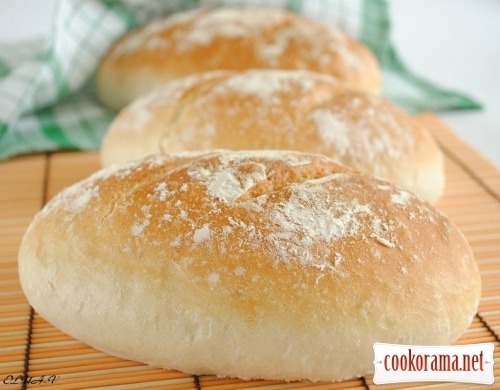 Bake bread first 15 min with steam, next remove bowl with water and bake bread till readiness, or till golden color. Top of recipe "Bread by XAVIER BARRIGA"